Audio Damage are a two-person company who have been building plug-ins since 2002. Their devices range from quirky (a neuron-inspired percussion synth, a rotary beat-slicer, a step-sequenced multi-effects unit) to indispensable (a variety of elegant and nicely designed reverbs, choruses, filters and flangers). 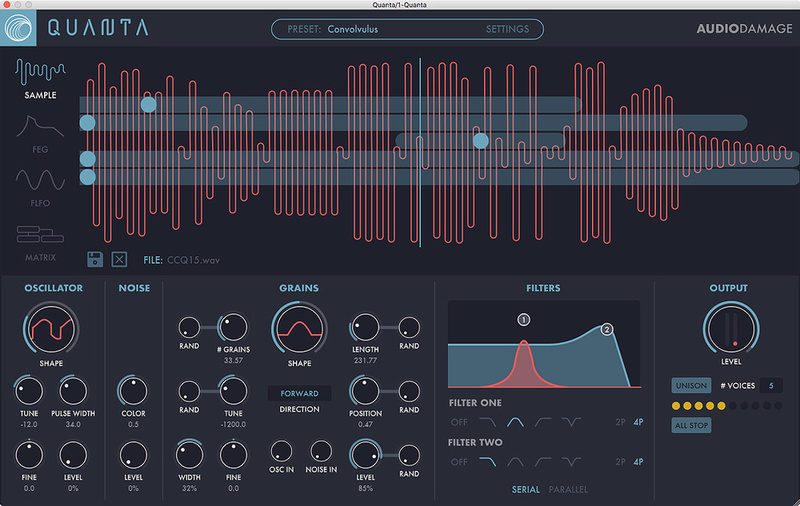 Following a recent stylistic refresh, which discontinued some rather dated skeuomorphic designs in favour of new clean, geometric interfaces, Audio Damage have now delivered Quanta, their take on granular synthesis. It’s probably their most ambitious software product and, at $99, their most expensive. Quanta’s default screen layout is pretty logical: by default the upper half of the display is a graphic of an audio source file, while the lower half features editing panels arranged in a fixed left to right order according to signal flow. Audio Damage’s complete rejection of skeuomorphism extends even to the audio display, which is rendered as a slightly abstract wiggly line rather than a realistic waveform. The waveform display is also used to indicate the triggering of notes and playback of grains. Quanta shows the synth’s voices as blue dots on the waveform: a dot appears when a note is playing, the dot’s horizontal position showing the location in the audio where grains are being generated. If grain location is randomised in any way, the dot spreads horizontally into an oval shape to show the range over which sample data will be read. In the lower half of the window, the first handful of controls (labelled Oscillator and Noise) are a bit of a surprise: these are for synthesized sources which can be mixed into the granular engine alongside the sample data to add some richness to the grains — or if you prefer, the sample can be removed completely, with the grains being created purely from the oscillator and/or noise. In addition, the oscillator and noise sources can be passed directly into the filter, bypassing the granular process altogether. You can add a fundamental pitch to a granular sound, for example, or even ignore the granular aspect totally and use Quanta as a subtractive analogue-style synth. The oscillator sports a continuously variable waveshape and pulse width, while the noise source has a colour control for changing sampling rate. Next along from the oscillator and noise sources are the controls for the granular engine. There are knobs for the number of grains created per second, the grain length in milliseconds, pitch tuning, sample position, volume level and stereo width. The main control knob sets the grain envelope shape: there are 10 distinct choices, with various attack and decay curves. The grain shape, grain length and creation rate interact to determine how smooth, or how pointillistic, the final audio will be. Finally, grains can be played forwards or backwards, and the direction can track progress through the audio source, or be randomised. The granular output feeds into a pair of resonant filters, each of which is multimode and can be two- or four-pole; the filters can be combined in parallel or series. Finally, the output controls set overall volume and number of voices, with an optional unison mode. As you might expect, Quanta sports LFOs and envelope generators, which it calls FLFOs and FEGs respectively (the F standing for ‘flexible’). Like the dedicated oscillator, the two LFOs have a continuously variable shape, ranging from two peaks per cycle through to triangle and square wave. An additional skew control squeezes the centre of the cycle to the left or right (providing PWM on the square wave), while a warp control does what I can best describe as compression or expansion of the wave shape vertically. The FLFO panel is shared with a simple Sample & Hold generator, which can be triggered from LFO, envelope generator, or random noise source. FLFOs and Sample & Hold support tempo sync and note retrigger. Unusual LFO waveforms are possible via Shape, Skew and Warp. Each of the four envelope generators (FEGs) has its own panel. An unlimited number of breakpoints is supported, the segments can be curved, and an arbitrary portion of the envelope between two breakpoints can be looped in a single or bidirectional manner. As with the FLFOs, the FEGs can be sync’ed to tempo (each segment adopting a metrical duration), so at a pinch they can be treated as step sequencers. I was slightly disappointed to note that there’s no visual feedback as FLFOs and FEGs are triggered: it would have been nice to see small dots moving along the graphics as notes were played, as one sees in Bitwig Studio, FAW Circle and other environments. Breakpoints and looping in the envelope generators.FLFOs, FEGs and the various other modulators are brought to bear on the synth architecture via a matrix modulation scheme, which supports MIDI Polyphonic Expression (MPE) sources. While all the modulation sources fit along the top of the window, the matrix view has to be scrolled vertically to see all the destinations. Needless to say, most of the animation in Quanta’s presets comes from judicious use of the modulation matrix. I was naturally drawn to compare it with the matrix in Ableton’s Wavetable synth, which it visually resembles. While Wavetable dynamically filters its matrix rows to just show those in use, Quanta shows all rows, whether active or not, so you often have to do quite a bit of scrolling back and forth between values you want to edit. And for some reason, the mouse scroll wheel doesn’t scroll within the matrix display but changes parameter values instead — so you have to make sure you’re scrolling on the scrollbar or row of titles. Part of the modulation matrix. A click on the preset name at the top of the Quanta window brings up the pane associated with preset management. The built-in factory presets include ‘artist series’ ones by Chris Carter, Joseph Fraioli, Marcus Fisher and Richard Devine, and in addition there are factory presets arranged by category (keys, pad, rhythmic, soundscape). Each preset is displayed alongside information about its sample file, although the sample data is actually encapsulated as part of the preset, which means it can be copied and pasted, and saved in your DAW, regardless of the location of the original sample. (Audio Damage’s Chris Randall showed me live copy-and-paste of a preset, with sample data, between Quanta on the Mac and Quanta on an iPad Pro.) There’s a preview button for hearing the sample played back in its raw form, but no indication of sample length. And I would have quite liked to see a little visual image of the sample waveform too. The sounds on offer are pretty varied, but most have a recognisable granular texture that, like Marmite, you probably love or hate. Some of the sounds in the rhythmic category are more obviously rhythmic than others — when your basic sound is so highly textured and dynamic, it can be tricky to impose an additional sonic attribute which is clearly locked to the beat. Many of the most successful sounds seem to be ones which make subtle use of the built-in oscillator to provide tonal and pitch stability — and there’s no shame in treating Quanta as a subtractive synth with granular icing on top if that gets you a usable result. But as with all sample-based synths, the choice of sample material is crucial: you might well want to go off and make short tuned samples or riffs from other instruments and try those inside Quanta to get a feel for how they can be manipulated. And if you’re looking for another excuse to fire up that Eurorack modular, this might be it. I own and use a lot of Audio Damage plug-ins, so Quanta had a familiar look and feel out of the box. Even so, the visual design is sufficiently logical and uncluttered that it’s really easy to find your way around. The provision of built-in oscillator and noise generators is a nice touch, extending the instrument’s range into more conventional analogue synthesis, and MPE support is welcome, if your DAW supports it. My only minor quibbles would be with navigating the modulation matrix, and a lack of visual feedback when setting up and playing with modulation sources — you’ll just have to use your ears rather than your eyes! If you’re looking for an approachable but versatile route into granular synthesis, Quanta fits the bill. Built-in oscillator and noise source. Powerful LFOs, envelope generators and modulation matrix. Could do with a bit more visual feedback for the modulation system. Modulation matrix is slightly inconvenient to edit. 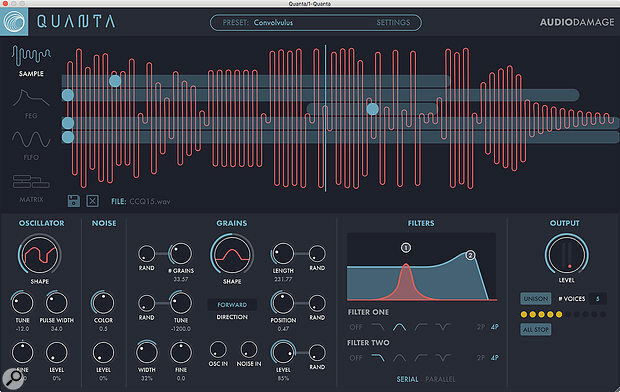 Quanta is an easy-to-use and visually elegant granular synthesizer. It has built-in oscillator and noise source, and sports a versatile MPE-compatible modulation matrix for building rich, responsive sound textures.